1. Coarsely grate the carrot and squeeze out any excess juice. Place in a large bowl with the shallot. 2. Add the lentils and quinoa, beef mince, sun-dried tomato paste and the egg. Combine well and shape into four even-sized burgers. 3. Grill the burgers for 5-7 minutes on each side until golden brown and cooked through. Serve with the salad. 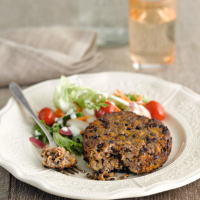 Burgers made with lean mince and bolstered by fibre-rich puy lentils and quinoa offer a quick and healthy supper. A spoonful of sun-dried tomato paste lends a rich, intense flavour. Alternatively, you could add whole toasted spices, such as cumin or fennel (lovely with pork), a handful of chopped fresh herbs, such as parsley or basil, some chopped pickled jalapeños or preserved lemons. If making lamb burgers, add a spoonful of Belazu chermoula paste.